Captivating creation selected for our Riviere bracelets catalog. Read the detailed characteristics of this jewel at the end of this page. 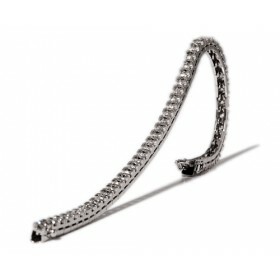 Bracelet made in 18K white gold (750 / ooo thousandths) Riviere style. 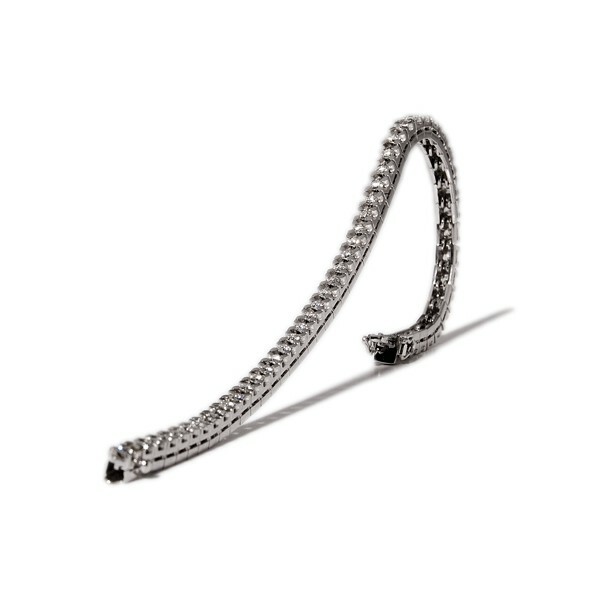 The meshes of the bracelet are of the type of four staples or square claws, leaving the diamond solidly crimped, and are independent with each other to provide the movement and flexibility characteristic of a Riviere bracelet; additionally, they are joined together by twin, bolted and individually welded crosseys for greater safety. 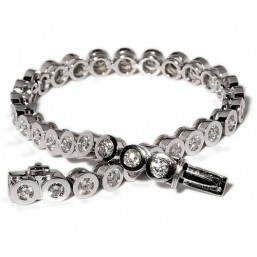 The closure is tongue-and-groove type, with a high security closure type eight, guaranteed the difficulty of opening the bracelet. It has a final weight of 16'40 grams of white gold (0.7585 ounces) and a rhodium finish. 52 brilliant cut diamonds with a total weight of 1'86 cts. Color E-F-G-H (the most transparent and quality diamonds are E-F-G-H). Purity VVS2-VS1-VS2. Perfect or very good or exceptional or extra size (cut diamonds fulfilling very strict requirements regarding the percentage of the depth and the percentage of the board, these excellent proportions optimize the fire and the brilliance of the diamond). Both the color, purity and size will be detailed exactly in the independent gemological certificate that we will deliver to you with the piece (in this description you have read exclusively we indicate an approximation to the final result, since it is impossible to make a detailed and individualized detail for each piece without the independent gemological certification of the same, the thresholds of quality, however, are of extremely high degree, and this will be reflected in the jewelry certificate, in the independent gemological certificate and in the detailed invoice). This jewel is also available in yellow gold.